Commissioned by CPCS, Myanmar: Portraits of Diversity is a series of short films seeking to stimulate discussion and move audiences towards recognizing, accepting, and celebrating religious diversity in Myanmar. Directed by Kannan Arunasalam, the films present individuals from Myanmar’s different religious communities and highlight the inter-faith connections and engagement that take place naturally around the country. Featuring stories of cooperation across religious and ethnic divides, as well as the capacity for peace leadership within the country, community leaders share analysis and insights into the threat of inter-communal violence and illustrate the capacity for peace leadership. The film series seeks to stimulate alternative narratives regarding ethnic and spiritual issues in Myanmar where tolerance and cooperation are highlighted, rather than conflict and persecution. Screened together with guided reflections, the films can be used as tools to stimulate exchanges of ideas about diversity and tolerance, and to create a space to foster acceptance and share visions for the future. The issues raised by individuals featured in the films can be used to generate discussions on Myanmar’s different religious communities and highlight the kinds of inter-faith connections and engagement that take place naturally around the country. A discussion and study guide is available for each video portrait, followed by suggested activities that can also be adapted to different learning environments. For each film, background is provided on the person and their context, followed by five discussion questions and extension activities. FILM STUDY GUIDES: A study guide is available to accompany screenings of the films. Click to download English or Burmese. Please contact us if you need any further information. 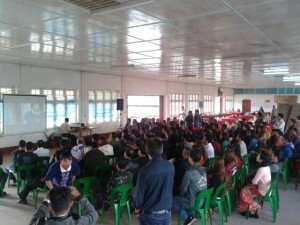 Portraits of Diversity post-screening discussion for students at Mae Ra Ma Luang camp, Thailand-Myanmar border. Click on the links below to explore the Myanmar: Portraits of Diversity series. Applied Conflict Transformation Studies - ACTS updated their cover photo. Applied Conflict Transformation Studies - ACTS is with Betchak Padilla and Shruti Chaturvedi at Centre for Peace & Conflict Studies. Applied Conflict Transformation Studies - ACTS is with Betchak Padilla and Shruti Chaturvedi. Applied Conflict Transformation Studies - ACTS is at សៀម រាប Siem Reap, Cambodia.